WX VALOR is among the coolest protective eyewear, designed to provide hunters and shooting sports enthusiasts with an unparalleled level of vision protection, optical performance and versatility. 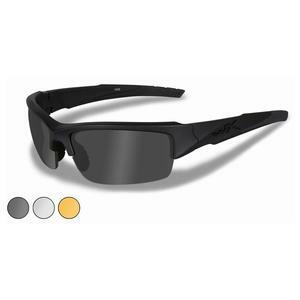 These cool sunglasses provide you with a complete shooter’s system, matching a Matte Black frame with interchangeable Smoke Grey, Clear and Light Rust lenses. Extra interchangeable lenses are also available, turning every pair of these tactical sunglasses into an adaptable eyewear system for shooters. The lenses are designed to be easily removed and replaced in the field, for the ability to quickly adjust to any light conditions and shooting situation. Whichever lens you choose, Wiley X’s superior optics provide shooters with clear, distortion-free vision in any conditions. Whether you choose prescription sunglasses, polarized sunglasses or any other alternative, you can be sure they will provide you 100% UV protection, the kind of protection that has made our brand trusted worldwide by armed forces, racing superstars and extreme athletes. These tactical sunglasses are designed for easy changing of optional lenses in the field, for the ultimate in versatility.